You can add ad hoc text in a row of a financial report. This includes the ability to add blank rows (designated as text) to improve the appearance of the report. Your entry is identified as TEXT in the Row Type column. 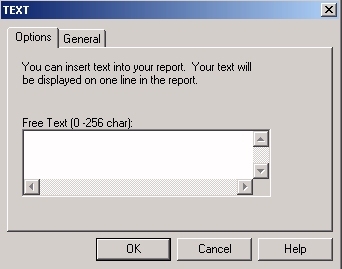 Select a row in which you want to add text or create a blank row in the report. Click the Text icon on the Financial Report Painter toolbar. Right-click anywhere in the row (except on the label) and select Change Type to. Select Text from the context menu. The Text dialog box opens. Type up to 4096 characters of text in the text box, or leave the box blank. TEXT appears in the Row Type column. If you entered text, its display starts in the Title column. If you left the entry box blank, an empty TEXT row appears. Tip: After you have identified a TEXT row, you can type its content directly in the Title column on the matrix. Enter up to 4096 characters of text, which will appear on the matrix starting in the Title column.